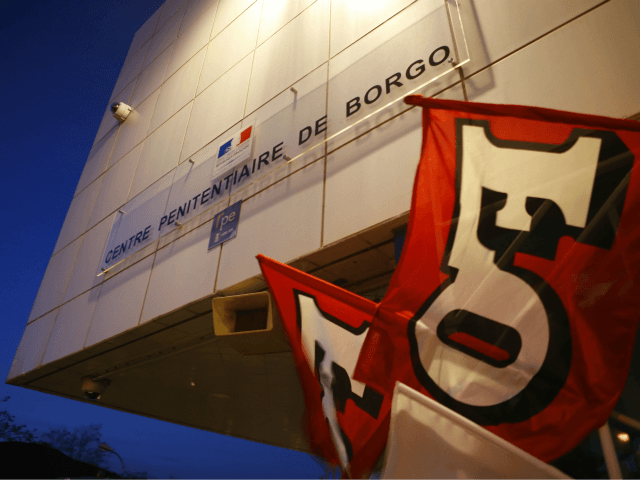 Two French prison guards at the Borgo prison in Corsica were wounded Friday after a group of three inmates including a radical Islamic extremist attacked them with knives while shouting “Allahu Akbar”. One of the guards was severely wounded in the incident and had to be transferred to a hospital in the nearby city of Bastia where he received treatment for his wounds, according to Bastia prosecutor Caroline Tharot. While Tharot did not comment on further details about the case, it was confirmed that one of the men involved in the attack was under observation for being a radical Islamic extremist, Europe1 reports. According to sources close to the investigation, the three inmates involved in the attack fortified themselves in a cell after the incident until Gendarmes officers arrived in around a dozen vehicles, secured a perimeter around the prison, and arrested those involved in the attack. The incident is just the latest in a series of attacks on prison guards and police in French prisons and detention centres. Last month at the Vincennes Administrative Detention Centre, which houses failed asylum seekers, several guards were injured after migrants started fires in an attempt to escape the facility. Earlier this month in Vendin-Le-Vieil prison, several guards were also attacked by a well-known radical Islamic extremist named Christian Ganczarski who had previously been a member of the terrorist group al-Qaeda and reportedly had direct contact with Osama Bin Laden. Islamic radicalisation in French prisons has become a major problem for the government in recent years. More and more criminals, many from migrant-heavy suburbs, are becoming radicalised in facilities like Fresnes prison where two inmates were caught plotting a terror attack to be carried out upon their release. The pair were also found to be communicating directly with the Islamic State terror group through mobile phones they had smuggled into the prison. In 2016, Belgian politician and European Union (EU) Counter-Terrorism Coordinator Gilles de Kerchove warned that the prison system could radicalise jihadis even further if they were placed in them after returning from the Middle East.